Explore the picturesque waterways of Holland and Belgium on this superb cruise from the quaint town of Haarlem. Discover Aalsmeer's colourful flower auction, enjoy a visit to the world-famous Keukenhof Gardens and admire traditional pottery at the Delft Pottery Works. La Nouvelle Etoile then cruises through the busy port of Rotterdam and on to the fortress town of Willemstad and Flemish city of Antwerp, where this is a visit to Rubens' home. See the sights of Ghent, home to the famous painting, "The Adoration of the Mystic Lamb" and spend time at leisure in Bruges, known as the Venice of the North, before this relaxing holiday comes to an end. La Nouvelle Etoile carries just 8 passengers, and has an elegant saloon, dining area and a piano bar. The spacious sun deck has a hot tub and eight bikes for exploring ashore. Guests are met in Amsterdam and transferred to the hotel barge moored in the quaint town of Haarlem where there will be a champagne welcome. There will be time to relax and then take a short walking tour of Haarlem. 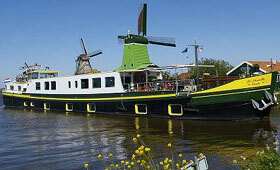 Upon return, La Nouvelle Etoile will set off for a short cocktail cruise through Haarlem and moor for the night near Cruquius. Tonight will be your first, of many, gourmet meals on board. After breakfast, head to Aalsmeer's colourful flower auction before returning to the barge and cruising along the canals to Lisse. Enjoy lunch before travelling to the world-famous Keukenhof Gardens with its fantastic display of flowers. Later, visit the Delft Pottery Works where the renowned pottery is still made, before rejoining La Nouvelle Etoile. Dinner on board. La Nouvelle Etoile cruises to Rotterdam. This morning, take the opportunity to visit the ancient distillery of Ketel One, where one of the world's most famous vodkas is produced. Rejoin the barge and cruise through the busy port of Rotterdam and across the Hollandsch Diep to Willemstad. Dinner on board. La Nouvelle Etoile crosses the border into Belgium and cruises to the Flemish city of Antwerp, where this is a tour of Rubens' home and the opportunity to explore the beautiful old quarter. After breakfast, cruise the "Sea Schelde" into the quaint town of Ghent. Admire the famous painting, "The Adoration of the Mystic Lamb" by the Van Eyck brothers or perhaps take a stroll through this picturesque town on your own. Dinner on board. This morning, arrive in Bruges, nicknamed the Venice of the North. Take the opportunity to explore the fascinating museums or enjoy a boat trip along the tranquil canals which meander through this beautiful city. Captain's Farewell Dinner on board this evening. After breakfast, disembark and transfer to the drop off point in Bruges.